I am pleased to welcome debut author, Leo Hunt onto the blog today, to talk about his Big Break into publishing. 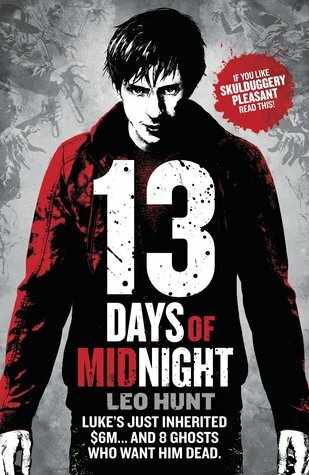 Leo's debut novel, Thirteen Days of Midnight, is published by Orchard Books in July. Your debut novel, Thirteen Days of Midnight is soon to be published, how does that make you feel? Thrilled and terrified. The novel has existed in its final draft for about six months before publication, so there’s this air of terrible inevitability about the process. The die is cast. You have this psychic defense of ‘oh well I can always rewrite this part’ before the final text is set, but once you’re done then you’re done. I’m just really curious to find out what people think of it. Can you give me a one line pitch for your book, so that my readers can get a feel for it? 16-year-old Luke Manchett inherits his estranged father’s ghost collection, ends up in big trouble. How does it feel to finally have your name on a book? Weird. Some reviewers refer to me as ‘Hunt’, which makes me feel like I’m being addressed by a 1930s schoolmaster. Both my grandmother and mother wrote novels for children which never made it to publication, so I’m happy to finally represent the Hunt dynasty in print. Which character do you most identify with in Thirteen Days of Midnight and why? Difficult question. Although the obvious answer would be the protagonist, Luke, I think I’m a better fit with his friend Elza. Luke’s quite sporty and (superficially) confident, which was never me at all. Elza is much closer to who I remember being at 16: feeling a little isolated, arty in a place where it can feel like there aren’t many other people like you. I think there’s a streak of arrogance in Elza, and she can be pretentious in that special way of teenagers, so there was some definite self-parody that went into her character as well. So I’d say Elza is the character I feel the closest kinship with, and she’s always fun to write dialogue for. The first page was written on 25th September 2010, and the final draft was completed on 8th December 2014. So just over four years. I should point out that this wasn’t four years of constant re-writing; I was a full-time university student during this period of time, which limited how much work I could do. There were also long fallow periods where I didn’t work on the novel at all. The first draft took nine months, the final re-draft took just over three. Whatever I’m doing I try to hit 1000 words a day. I’m much faster at composing prose now than I was in 2010. Yes and no. I sent out eight queries before I signed with my agency. The first eight queries were mostly immediate rejections, and I think I’m still waiting on a few responses! I met my agent in 2011 when she came to give a talk at my university, and I was able to pitch my story to her in person, using the same line I answered question two with. She was interested, gave me her personal email address, and I was a known entity to her. I ended up signing a contract in 2012. There are so many manuscripts coming in to agents every week, and if you can give the agent a good pitch in person it will definitely help. Did you ever feel like quitting writing? I’m happy to report it never crossed my mind. I thought it might take a lot longer than it did to get a book published, but I was very determined. I don’t see myself as an overly driven person, but this was something I knew I could do and would do. That said, it is extraordinarily tough to get published, and it’s possible that my faith just wasn’t tested enough. The story of Job comes to mind. If I’d gotten nowhere after twenty solid years of submitting work, I might well start thinking of quitting. It’s hard to know how you’d respond unless you’re in that position. The novel went through one very serious re-draft, in which it was cut down from 100,000 words to a more manageable 60,000. This involved a lot of re-structuring, and the final draft still has the same chapter progression and plot that I instituted in this draft. After that I let it lie for almost a year because I was in the final stages of my undergraduate degree, and then it went through an intensive six-week editing program before my agent took it to the 2014 London Book Fair. So twice, but over quite a long period. I remember feeling astonished, mainly because I was in a pitch-black low about the manuscript and didn’t think I’d done nearly enough work, partly because it was also final essay period (in retrospect I think I nearly died of overwork during that month). I ended up getting four offers and the manuscript went to auction, so maybe you’re always your own harshest critic. I was definitely surprised at the response to that draft. Who was the first person you told about your book deal? Mass text message to my family. I rise with the dawn, take a brisk walk amongst my estates, and usually breakfast in the African Room. My manservant brings me the day’s papers, along with correspondence from fans, friends, enemies, lovers past and present, etc. I compose at an oak desk which overlooks my terrapin terrarium. Lunch is at twelve. After digesting for an hour I normally exercise, either by racing a horse on foot, yoga, star-jumps, or bare-knuckle fighting with a horse. A healthy body breeds a healthy mind. I spend the afternoon re-copying the morning’s work, then break at seven for dinner and billiards. After winning easily at billiards I can finally take out the scotch and drink myself into unconscious bliss. It’s not an easy life, but I wouldn’t wish for any other. I would say you need to read widely. And I really do mean widely. If you are serious about being a writer and the craft you will never stop reading. Every writer, every book, good or bad, has something you can take from it, some quirk of voice, a literary technique, an idea you’ve never come across before. Even the most tedious, turgid, derivative novel can teach you something: it can teach you what not to do. Don’t be afraid of nonfiction, as life is often stranger and more interesting than anything anyone could invent. And I would add, please go outside your comfort zone. If you only read fantasy stories, pick up a novel about real people in the real world. If all you read is realism, please try a book with spaceships or dragons in it. If you’re only familiar with modern fiction then read something that was written back before our english language even existed. Your writing will never suffer for having a larger pool of influences to draw upon. I’d say please remember that art is work, not divine inspiration, and ideas are actually the easiest part of writing a novel. The successful execution of the idea is what is difficult. I’d say that to get into traditional publishing as it stands you’ll need an agent, and to get an agent you’ll need to be (a) good at your craft (your first draft of a first novel is unlikely to be good enough) and (b) you’ll need to know how to pitch your idea and send successful queries to agents. The Query Shark blog was very helpful to me in this regard. I’d say be kind to yourself. Making stories is difficult work. There’s lots of self-doubt involved, and frustration, and getting published doesn’t ease any of that up (trust me). You have to be able to accept that you’ll make mistakes, and won’t be perfect, and that doubt is part of being a writer. And finally I’d say that the only way you can truly learn about telling stories is by doing it. When I saw his picture, I was like he reminds me of the Dr. Owen Hunt from Grey's Anatomy and coincidentally they share the same last name. 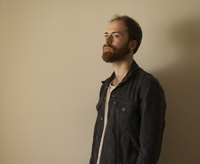 Nice interview by the way and nice inspiration for me to continue to write. P.S. You should bold the questions and align the words left or justified instead of center. It makes for easier read.